If I told you I've found the secret to overcoming picky eaters, you'd probably look at me puzzled. How could I have found the secret and NOT SHARED IT YET?! Unfortunately, there is no "secret." However, there are many ways to encourage children and even adults to develop a love of fruits and vegetables. 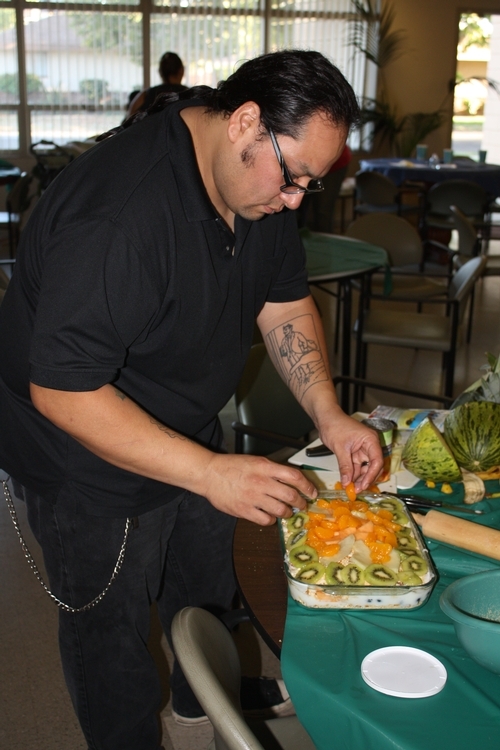 UC CalFresh works with low-income families to encourage healthy food choices through nutrition education and healthy taste testing. 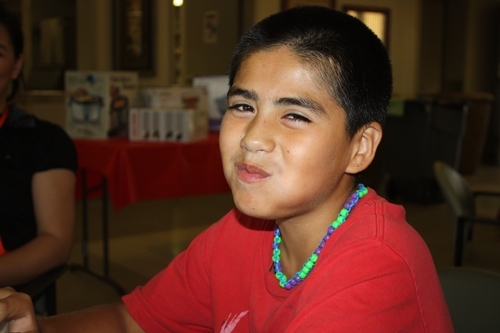 Taste testing has been a helpful tool in providing children and their parents an opportunity to explore foods they wouldn't have otherwise tried. Sometimes they have had the fruit or vegetable before but didn't enjoy the way it was prepared. A fresh approach with a new recipe can mean all the difference! Allow children to take part in developing healthy meals and snacks by giving them a fun name. 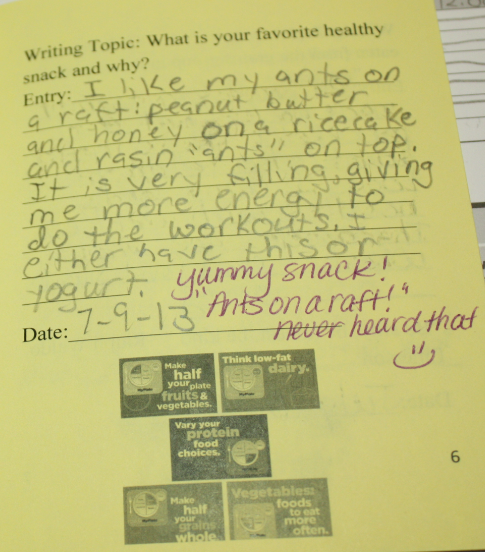 A child participating in our recent Healthy Lifestyles Fitness Camp shared her favorite healthy snack in her nutrition journal. She enjoys eating what she calls "ants on a raft." 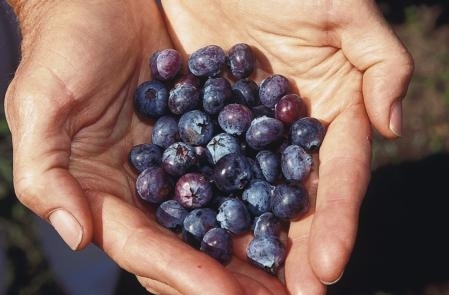 Enjoy the bounty of healthy fruits and vegetables available this season. Try something new! Even better yet, try a food you haven't enjoyed in the past, but prepare and serve it in a new way. Well I’m a summer baby, and I’m here to help you survive the heat wave with healthy recipes and family cooking tips. Summer time is the best because of all the amazing fresh fruits and vegetables that are in season. With berries, melons, cucumber, tomatoes, squash and stone fruit the cooking possibilities are endless! Make a summer salad. Layer chopped cucumber, tomatoes and green beans and top with lettuce and your favorite dressing. Cut back on the calories in your dessert by eating fresh fruit instead. 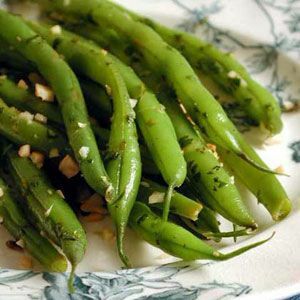 Search for refreshing, in-season recipes on MyPlate’s Pinterest page. Summer means the kids are home and they are bored! So let’s get them in the kitchen and cooking. Here are some tips on how to get your little ones involved. Give them a choice of healthy recipes. Allowing them to choose means they will be more likely to participate in creating a healthy meal. Play with your food! Use a banana, strawberries, peanut butter and pretzels and create a creature or fun face. Make fruit pops with the kids. 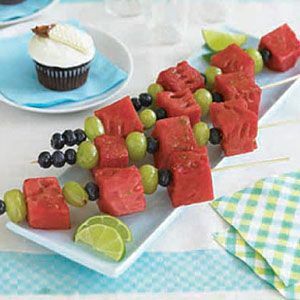 Simply blend up fresh berries, melon or stone fruit and freeze it in an ice cube tray with sticks. You can also use this fruit blend as ice cubes to flavor your water. At the University of California Cooperative Extension, were helping to build and maintain healthy families! For additional healthy tips, visit our webpage. 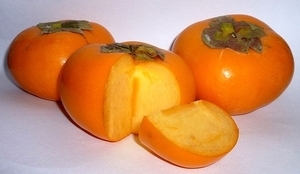 The type of persimmon that you can eat right off the tree is the Fuyu variety (left), a firm-fleshed, yellow- to orange-skinned fruit that is flat on the bottom and wider than it is tall—sometimes twice as wide. 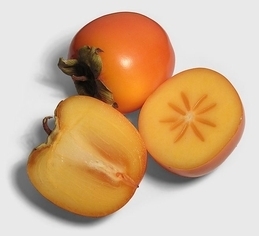 You can eat the fresh, sweet fruit like an apple or cut up in salads or you can dry it on the stem or cut in slices for a home dehydrator. 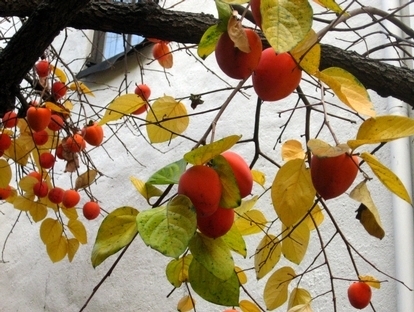 This recipe for Hachiya persimmon cookies has been in my family for generations and is always a special treat in the cold months. The cookies have a moist, cake-like consistency and can be eaten fresh or bagged up by the dozen and stored in the freezer. They're quick to thaw and they taste great. We usually make a double or triple batch just to take advantage of the fruit's availability, so cookie storage can be an issue. Drop the dough in generously rounded teaspoonfuls on a greased cookie sheet and bake in a pre-heated 350° oven for 12 to 14 minutes. Amidst recent headlines that the United States population falls short in consuming the recommended servings of fruits and vegetables, a group of dedicated parents in California’s Central Valley have demonstrated that one small change is a big step towards health for children and families. Fresh tomatoes add vitamins A & C to this parent's dish. 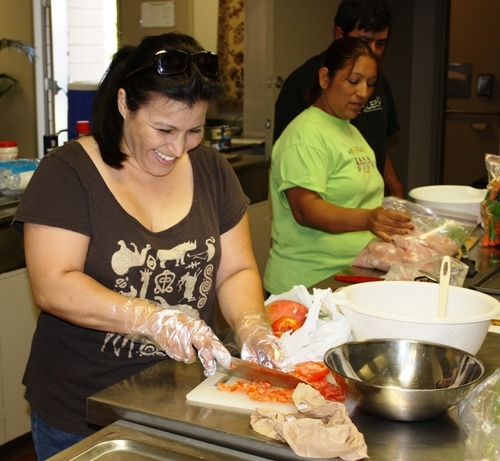 As part of the City of Fresno Parks and Recreation Department’s Healthy Lifestyle and Fitness Camp for Kids, parents and kids participated in a series of nutrition education classes lead by the UC Cooperative Extension’s Food Stamp Nutrition Education Program (FSNEP). Following several weeks of classes on reducing fat, sugar and salt, and increasing whole grains, low-fat dairy and fruits and vegetables, groups of parents were invited to flex their nutrition muscles by making small changes to some of their family’s favorite recipes. Their goal? Improve the nutritional value of their dishes through small changes like increasing fruits and vegetables while decreasing ingredients high in fat, sugar and salt. Fresh vegetables are a great addition; frozen veggies are also a great choice. 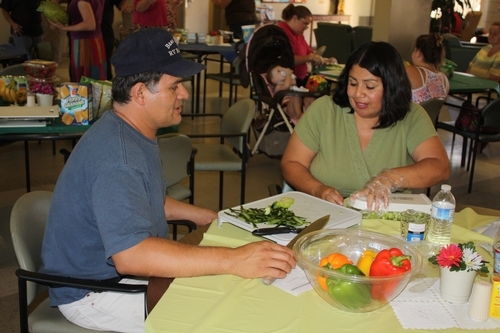 Competition was healthy as teams of parents assembled their entries for the City of Fresno’s Inaugural Healthy Lifestyle and Fitness Camp Parent Cook Off. Think Bravo’s Top Chef meets Food Network’s Challenge, minus all the truffle oil and stage lighting. 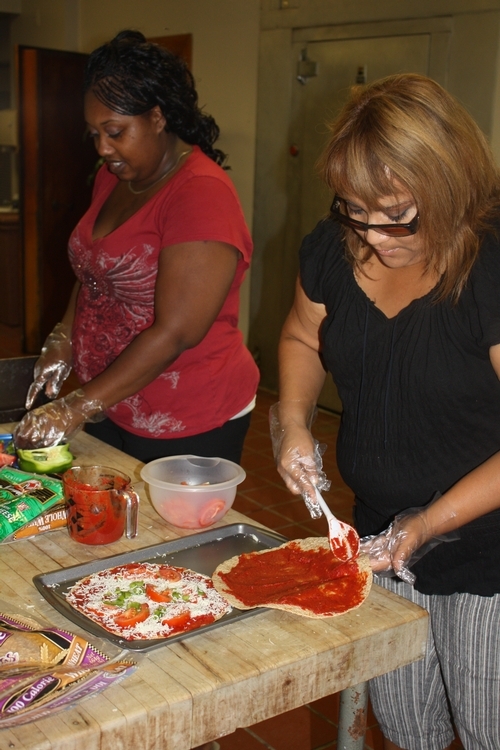 FSNEP educators were nutrition education partners with the parents to note original recipe and the parents' creative changes. Not your average pizza. Small changes like using whole grain tortillas, fresh tomatoes and light cheese improve the nutritional value of this family favorite. Fruit and yogurt are a perfect pair. Judges that lent their palettes to parents’ culinary adventures included: local Kaiser Permanete nurses, fitness camp counselors including Amanda Cogdill, recreation specialist, and UC Cooperative extension’s Jeanette Sutherlin, county director, and Connie Schneider, nutrition, family and consumer sciences advisor. One of the winning recipes was the taffy apple pizza. Parents cut the fat and sugar drastically and paid attention to portion size to make this family favorite a healthy hit! It was so popular, camp counselors prepared it for the parents’ children participating in the Healthy Lifestyle and Fitness camp. 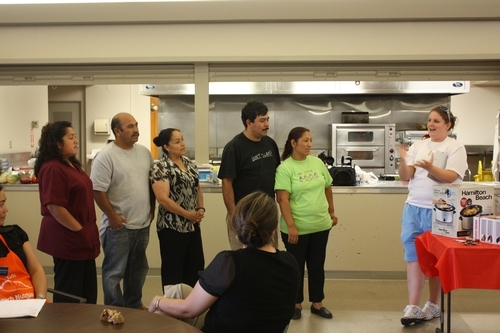 One of the winning parent groups is recognized for their efforts. What small change can you make to your family’s favorites?